A smiling face with curved eyes and open mouth. Upper teeth are shown. The curved nature of the eyes make the eyes appear as if they are smiling as well - hence the name "smiling eyes." One of the original smileys. Old name: Happy Face with Open Mouth and Raised Eyebrows. 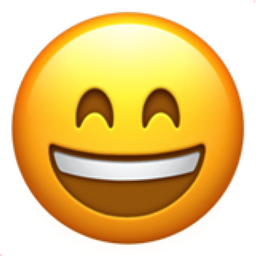 iEmoji old name: happy! happy! happy!